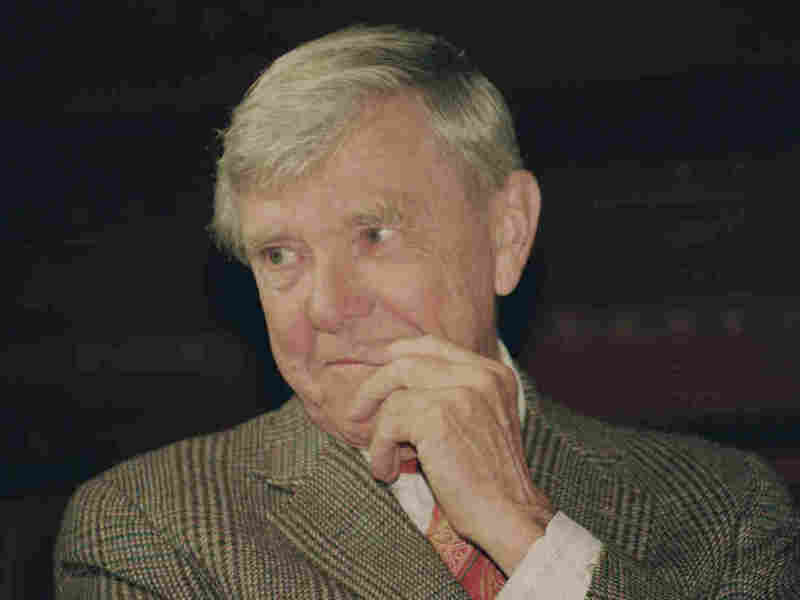 Pulitzer Prize-Winning Columnist Russell Baker Dies At 93 Baker made his name as a columnist for The New York Times, where he wrote thousands of columns over more than 30 years. He won one Pulitzer Prize for commentary, and another for his autobiography. Pulitzer Prize-winning author and humorist Baker has died at age 93. His son, Allen Baker, says his father died from complications after a fall. Baker got his start as a news reporter with the Baltimore Sun, but became known for his "Observer" column in the Times, where he commented on modern life with unmistakable whimsy. Though often pegged to the specifics of the time, many of his observations are just as relevant today as they were when published decades ago. A family member tells NPR that Baker was "a beautiful man." "We couldn't have asked for a better father," said his son, Allen Baker, according to the Baltimore Sun. "He was a tender and loving man to his family. ... He was just a Regular Joe with an extraordinary job." His son says Baker died after complications from a fall. Russell Baker looked like Gary Cooper and wrote like a dream. He was sardonic and idealistic at the same time. His autobiography, "Growing Up," brought tears to the eyes. This is the time to reread it. Staring at 90-cent peanut butter. Taking down an orange, looking for the price, putting it back. ... Old people at the supermarket make you wonder about all those middle-aged people you see jogging the streets to preserve their vascular systems for another fifty years. And about all the people of all ages all over the country who are eating less, drinking less, smoking less, driving safer, and in general looking for a deathproof safety suit to get them over the peak years and down into the valley of old age fit to enjoy the fruits of their abstention and labor. Will anyone care when they get there? ... Old people at the supermarket are being crushed and nobody is even screaming. Baker was born into humble circumstances in Loudoun County, Va. in 1925. His father died from a diabetic coma when he was 5. During the Depression, Baker sold magazines door-to-door. He first entertained the idea of becoming a writer as a child, he said in his 1983 memoir, "Growing Up," which won the Pulitzer Prize for best biography. Baker earned a scholarship to Johns Hopkins University, enlisted as a Navy pilot during World War II (but was never deployed overseas), and finished his degree after the war, the Washington Post reports. His career in journalism began at the Baltimore Sun, where he started as a police reporter before working his way up within five years to become London correspondent. After working as a White House reporter for the Sun, he joined the Times's Washington Bureau where he covered the White House, Congress, and presidential campaigns. He became a columnist for the Times in 1962 and wrote nearly 5,000 "Observer" columns until his last one ran in 1998. Baker's writing "matured into literature" when he moved to New York, the Times said in its obituary, demonstrating "an owlish wit, sometimes surreal, often absurdist, usually scouring dark corridors of paradox, always carried off with a subtext of good sense." Baker once said he never intended to be called a humorist; his goal as a columnist was to make politics and diplomacy accessible through easy to understand language, the Associated Press reports. "Well, as I soon discovered, in those days if you wrote short sentences and plain English in the Times, everybody naturally assumed you were being funny," he said. "We all come from the past," he wrote in his autobiography, "and children ought to know what it was that went into their making, to know that life is a braided cord of humanity stretching up from time long gone, and that it cannot be defined by the span of a single journey from diaper to shroud."